Time to add a pop of color! 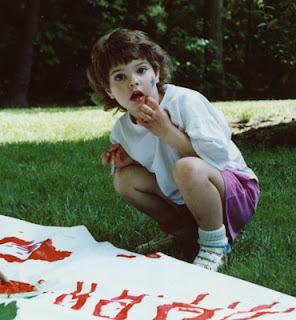 I decided on using the complementary colors to all this blue green, and settled on a nice strong orangey red. 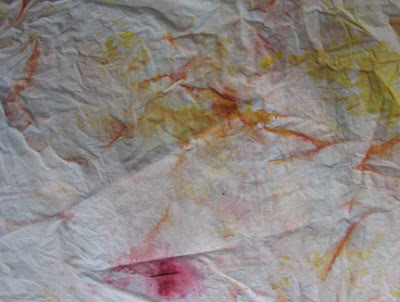 I used some lovely shades of Golden's tube acrylics, diluted well, to make some snow painted fabric (I'll share a tutorial for snow painting later). 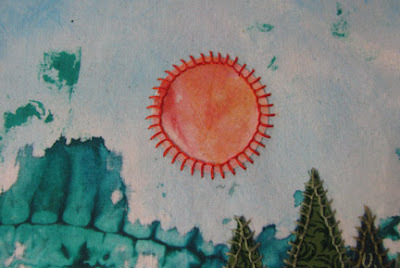 I choose a strongly colored piece of the resulting cloth and cut out a circle for the sun. The reason for using such a diluted method of painting the fabric is that I wanted the hazy look that you get over the mountains. The sun is rarely more than a glowing smudge in the sky when the clouds and snow spray are obscuring it. 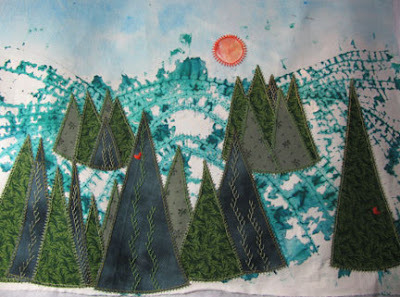 The sun was stitched on with the same "reverse" blanket stitch that I used for the trees. I mixed a strand of red with a strand of orange embroidery floss to get the exact color I wanted. Using plain red for a little extra pop, I stitched a couple of stylized cardinals onto two trees. Time to start adding beads! Thank you Limar :-) I am by nature drawn to monochromatics and analogous color schemes, so it's always so exciting to me to see how good it looks to add a complementary color for punch! I'm really enjoying seeing how this shibori quilt progresses. I love your trees and they remind me of some I made out of corduroy years ago. I haven't attached them to anything yet but they are still somewhere... 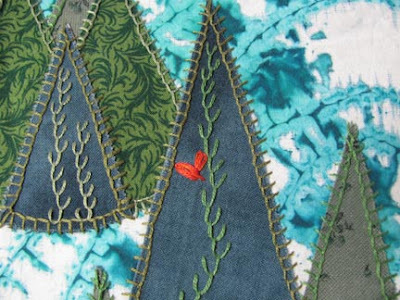 I like the reverse blanket stitch - never thought of that. Well, Cyndi, I am definitely NOT disappointed, this is gorgeous! What a wonderful piece, I love it! Ahhh I see the haze. You are right. Looking good. Thanks guys! And guess what...? Congratulations Cyndi, Your shibori quilt is awesome. You shared a lot of technique in there. Thanks. The red/orange definitely makes it pop. Is this a keeper? Thanks Shirley...yes, I've decided that the shibori technique is something I'm going to try again, maybe using a different stitch for variety.